STYLE: 31NU19X003. LARGE SECRETARY ORGANIZER WALLET. FABRIC: GENUINE LEATHER. CREDIT CARDS AND ID'S ORGANIZE. 9 CREDIT CARD SLOTS. Actual Images of item are shown above. STYLE: 31NU19X005. LARGE SECRETARY ORGANIZER WALLET. FABRIC: GENUINE LEATHER. 7 CREDIT CARD SLOTS. CREDIT CARDS AND ID'S ORGANIZE. Actual Images of item are shown above. STYLE: 31NU110003. FABRIC: GENUINE LEATHER. 12 CREDIT CARD SLOTS. COLOR: BLACK. CREDIT CARDS AND ID'S ORGANIZE. Actual Images of item are shown above. STYLE: 31NU22X026. FABRIC: GENUINE LEATHER. CREDIT CARDS AND ID'S ORGANIZE. THIS IS 100 % AUTHENTIC ITEM. 6 CREDIT CARD SLOTS. Actual Images of item are shown above. 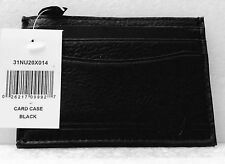 AUTHENTIC Nautica Leather Slim Credit Card Case Wallet. Nautica Signature Blue & White Stripe Lining. 100% Leather. Embossed logo detail on the front and back of the card case. Open Top Slot for more credit cards, ID or folded bills. STYLE: 31NU22X024. FABRIC: GENUINE LEATHER. CREDIT CARDS AND ID'S ORGANIZE. THIS IS 100% AUTHENTIC ITEM. 6 CREDIT CARD SLOTS. Actual Images of item are shown above. STYLE: 31NU22X023. COLOR: TAN. CREDIT CARDS AND ID'S ORGANIZE. 6 CREDIT CARD SLOTS. THIS IS 100% AUTHENTIC ITEM. Actual Images of item are shown above. Nautica Mens Crunch Passcase Wallet W/ Removable Card Holder- Pick SZ/Color.